To meet the growing demand of the pediatric neurology patient population, Lehigh Valley Reilly Children's Hospital is committed to increasing local access to this service line. As a result, pediatric patients now have a choice of four Lehigh Valley Health Network (LVHN) pediatric neurologists from whom to receive care. Joining Muhammed Sheikh, MD, in the department are Sameh Morkous, MD, chief of the pediatric neurology section, and board-certified pediatric neurologist Zuhal Ergonul, MD, PhD. Ergonul is one of the few neurologists nationwide with a subspecialty board certification in both pediatric neurology and headache medicine. Similarly, Morkous is one among a select group of pediatric neurologists in the United States who also is fellowship-trained in sleep medicine. "If patients with intractable seizures are screened for and found to have sleep apnea, their seizures may be better controlled by treating the sleep problem," Morkous says. He also will see patients with general pediatric neurology problems, like dysmorphic features, such as an abnormal size and shape of the head, headaches and symptoms related to sleep apnea, including snoring and episodes of breathing cessation during sleep. Ergonul's clinical concentrations are concussion in children and childhood primary headache disorders, such as migraine, in addition to other general pediatric neurology conditions, including seizures and developmental delay. 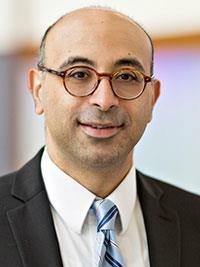 A graduate of the Alexandria University School of Medicine in Egypt, Morkous practiced previously for six years in Danville as part of the Geisinger Health System; he completed a sleep medicine fellowship at University Hospitals Case Medical Center in Cleveland. He also is a clinical assistant professor in the department of pediatrics in the school of medicine at Temple University. "I'm excited to be a part of LVHN's expanding pediatric neurology department and to help improve access so patients won't have to travel far for specialty care," Morkous says. After receiving her medical and doctorate degrees, respectively, from Ankara University and Hacettepe University in Turkey, Ergonul completed a postdoctoral associate in physiology and biophysics from Weill Cornell Medical College in New York City. She was previously an instructor in pediatrics there. "Pediatric sleep disordered breathing/obstructive sleep apnea." American Academy of Otolaryngology—Head and Neck Surgery. http://www.entnet.org/content/pediatric-sleep-disorderedbreathingobstructive-sleep-apnea. "Epilepsy fast facts." Centers for Disease Control and Prevention. http://www.cdc.gov/epilepsy/basics/fast-facts.htm. To refer a patient to pediatric neurology, call 610-402-CARE.